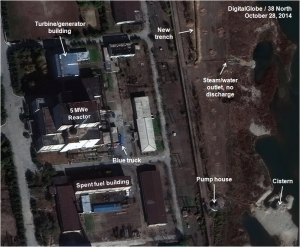 Recent commercial satellite imagery indicates that the 5 MWe plutonium production reactor at North Korea’s Yongbyon Nuclear Scientific Research Center remains shutdown after 10 weeks, longer than what is required for routine maintenance. 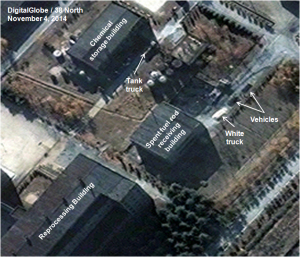 While it is too soon to reach a definitive conclusion, new evidence is accumulating that suggests: 1) the shutdown may have allowed the North to remove a limited number of fuel rods, possibly failed, from the reactor; and 2) Pyongyang may be preparing to restart the Radiochemical Laboratory, which separates weapons-grade plutonium from waste products in spent nuclear fuel rods. 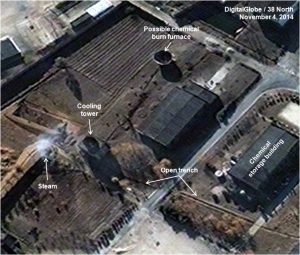 This assessment is based on three observations: 1) steam coming from a large cooling tower located at buildings associated with the Radiochemical Laboratory is consistent with maintenance, testing and other activities before commencing operations; 2) truck activity near the vehicle door to the building that receives the spent fuel at the reprocessing complex before it is moved to the reprocessing building; and 3) piles of gray material outside the old pilot fuel fabrication facility, now believed to manufacture fuel rods for the 5 MWe Reactor, that may indicate that a chemical process is taking place possibly related to the production of new rods. In another important development, construction has started on a possible new pipeline that would divert hot water/steam from the reactor cooling system currently dumped in the nearby river to another location, potentially complicating future efforts to monitor operations. 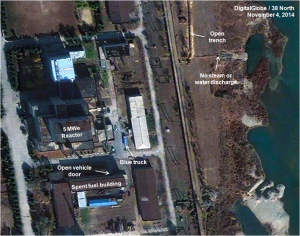 Recent commercial satellite imagery indicates that the 5 MWe Reactor has remained shutdown for a period of about 10 weeks, longer than what routine maintenance would require. As noted by the Institute for Science and International Security in its October 3 analysis, indicators of reactor operation—steam venting from the turbine building and hot water/steam emitting from the secondary cooling systems discharge pipeline—were not present during this period. 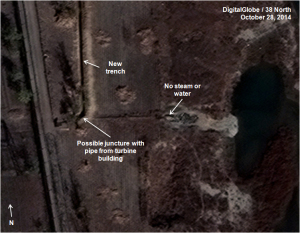 Imagery from October 28 and November 4 shows the continued absence of those indicators. Figure 1. The 5 MWe Reactor appears to still be shutdown in October. Figure 2. Little change by early November. 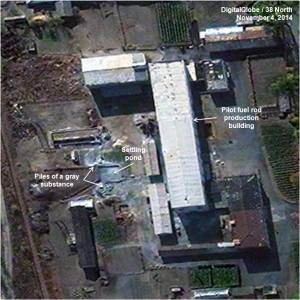 Imagery also indicates new activity at Yongbyon’s Radiochemical Laboratory, the facility where weapons-grade plutonium is separated from the waste products in the 5 MWe Reactor’s spent fuel rods. Throughout the summer and into fall 2014 there was little activity at this facility. However, on November 4, steam was seen rising from a large cooling tower at auxiliary buildings just southeast of the plutonium separation building. These buildings contain repair workshops, chemicals for the complex, and waste treatment plants. Figure 3. New activity seen at the Radiochemical Laboratory. In the same image, three vehicles—two trucks and one unidentified vehicle—are seen on the road in front of the door to the spent fuel rod receiving building at the reprocessing complex. The truck closest to the door is a white, possibly box-bodied vehicle; the second, a smaller truck surrounded by three or four people; and the third, possibly a trailer. Figure 4. Trucks and other vehicles seen at the Radiochemical complex. Figure 5. Gray piles are seen on the east side of the pilot fuel fabrication plant. Figure 6. New trench work being done. The facility was last used in 2009 but has been maintained since then. It is worth noting that, in the past, ash has been stored by the North Koreans in containers since the fine particles contain uranium and mixing it with water could cause serious health problems.